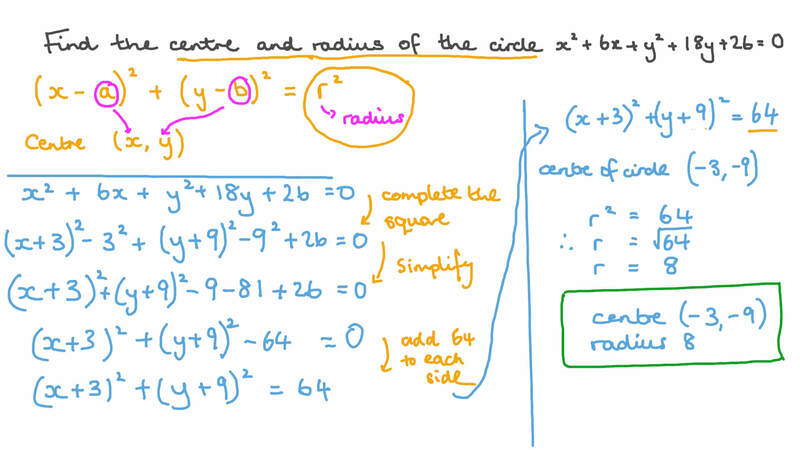 In this lesson, we will learn how to find the center and radius of a circle from its equation. 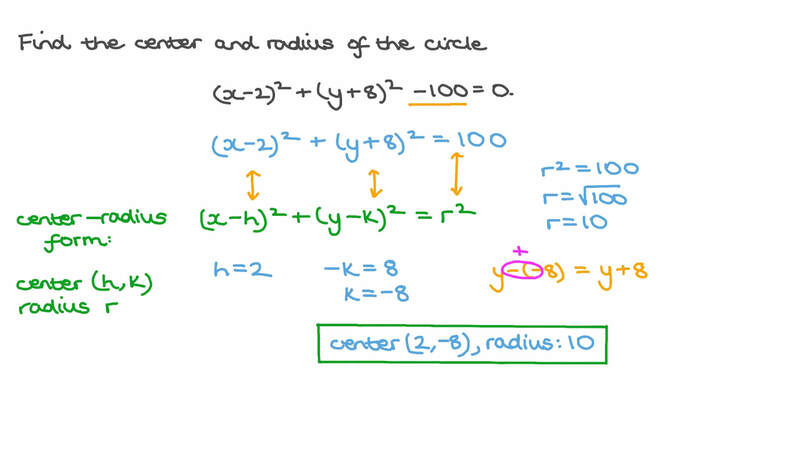 Find the centre and radius of the circle ( 𝑥 − 2 ) + ( 𝑦 + 8 ) − 1 0 0 = 0 2 2 . Find the center and radius of the circle 𝑥 + 6 𝑥 + 𝑦 + 1 8 𝑦 + 2 6 = 0 2 2 . Find the center and radius of the circle 𝑥 + 𝑦 + 1 0 𝑥 − 1 8 𝑦 + 4 2 = 0   . Find the center and radius of the circle ( 𝑥 + 4 ) + ( 𝑦 − 2 ) = 2 2 5 2 2 . By completing the square, find the centre and radius of the circle 𝑥 + 6 𝑥 + 𝑦 − 4 𝑦 + 8 = 0 2 2 . 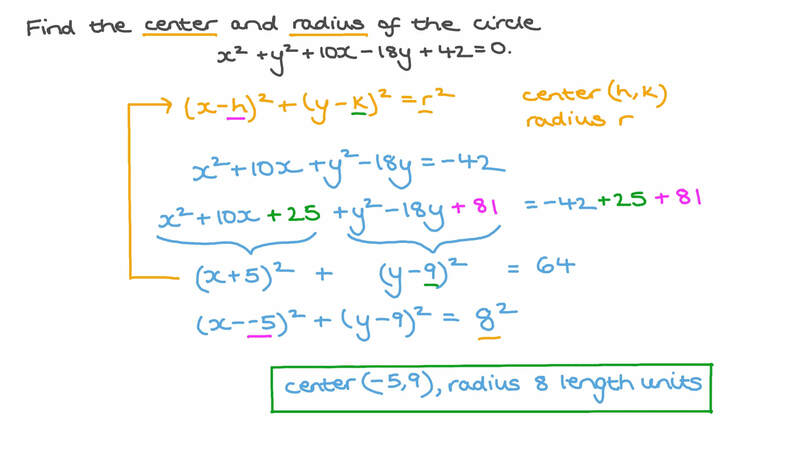 By completing the square, find the centre and radius of the circle 𝑥 + 1 6 𝑥 + 𝑦 + 1 2 𝑦 + 9 7 = 0 2 2 . Find the centre and radius of the circle 𝑥 + 6 𝑥 + 𝑦 − 9 𝑦 + 8 1 4 = 0 2 2 . Find the centre and radius of the circle 𝑥 + 7 𝑥 + 𝑦 − 4 . 6 𝑦 − 7 . 4 6 = 0 2 2 . Find the center and radius of the circle 𝑥 + 3 𝑥 + 𝑦 + 8 3 𝑦 − 3 4 5 5 3 6 = 0   . The line 𝑦 = − 7 touches the circle of centre ( 7 , 9 ) . What is the radius of the circle?